The current property market upswing has encouraged buyers and investors to re-enter the Singapore property market in anticipation of higher future property prices. A research report by DBS Insights said that the high land prices and momentum seen in the collective sales (en-bloc) market where developers have invested close to $27 billion in over 60 development sites since early 2017, are two of the main reasons of the property market upswings. The report noted that these sites are expected to yield more than 26,000 units, which will be launched in 2018-2019, and with displaced households waiting to buy a replacement home, coupled with expectations of higher selling prices by developers in the medium term, indicators point towards a sustained property market upswing. “At our assumed population range of 6.3m-6.5m by 2030, we project annual demand for primary homes will come in at 13k-16k till 2023, before tapering off to an average of 12k-13.5k units. These forecasts are above the historical average of 12k units transacted over 2001-2017. We believe that the upgraders market will be a key driver with c.17,000 HDB households per year eligible to upgrade to the private sector after the 5-year minimum occupation period. A wild card will come from potential foreigner purchases, which are not factored in our numbers, and could be as high as an additional 10% of total transactions. This implies a CAGR (compound annual growth rate) of 1.5%-3.2% over 12 years. Supporting these forecasts is sustained income growth of 2.0%-2.5% p.a. and transaction velocity is expected to remain at/above historical average. The supply absorption rate is also projected to remain healthy at <4.0years, underscoring the case for higher property prices. With our expectations that income growth will keep pace with projected rise in property prices, we believe that household affordability should remain close to the historical average in 2030. With developers cognisant that households are “quantum sensitive”, the average home size is projected to shrink by c.20% to 840 square feet. On a per square foot (psf) basis, this will translate to a range of c.S$2,300-S$2,900 psf from S$1500 currently. rates and foreigner inflow) over the 2015-2017, total population is projected to grow to only 6.3 million by 2030. The bank analysed that this lower population growth provided for a bear case scenario and serve as a check on the property market upswing. The report said that given the different demand, income growth and the population growing to 6.3 million, it projected property prices to grow by 1.5 per cent in this period. Over the last 5 years, developers kept the transaction quantum stable in supporting the property market upswing by shrinking house sizes, the report said. DBS noted that the government has, in the past few years, maintained a tight immigration policy, and cautioned that a further tightening will result in a lower-than-projected growth affecting the property market upswing. 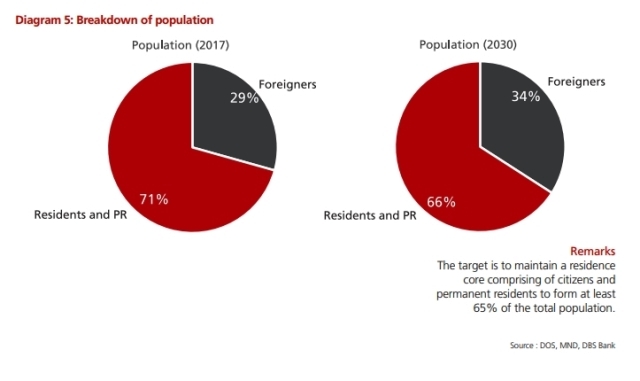 “Our positive call on the Singapore property market is premised on a 2030 population of 6.5m. However, if Singapore’s population misses that target, we could see demand for homes falling below our target of 15k-16k per annum. In our bear case scenario of 6.3m population, demand for homes is projected to be at 12,000 homes, in line with historical demand levels, implying that there is less impetus for prices to rise on a sustainable basis. The government has, in the past few years, maintained a tight immigration policy. A further tightening resulting in a lower-than-projected growth in non-resident growth rates might mean lower rental demand and thus result negatively impact property prices. In achieving our population growth target of 6.5m, we have assumed a 2.3% growth rate, vs 2015-2017 growth rate of 2.0%. We have not assumed any policy tightening in our forecasts. The recent hawkish tone from the government, warning of an exuberant property market could imply potential tightening measures if prices run up too fast. In our view, a more than 10% rise in property prices in a year may prompt the government to tighten. If you are home-hunting or are a real estate investor, our Panel of Property agents and the mortgage consultants at icompareloan.com can help you now. Previous articleIs it worth spending $20 million for the North Korean-US Summit?